Yahari Ore no Seishun Love Comedy wa Machigatteiru. adapts volumes 7 to 11 of Wataru Watari's light novel series of the same title. 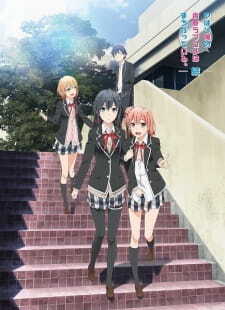 Prequel: Yahari Ore no Seishun Love Comedy wa Machigatteiru. I don’t know about you, but my high school years were… not very exciting. I spent a lot of time by myself, reading in the corner of the classroom or somewhere quiet in the library at lunch. I had a group of friends, yeah, but there were only a few that I’d ever really talk to. Even then, I’d always decline if they ever asked me to go out somewhere, telling them about how busy I was or how I “had other plans”. I never said much. I remember a few of my classmates sometimes asking why I was so quiet all the time, why I only tried to just sit there and read. I never knew how to answer. That was just how I was, I guess – I didn’t like talking, and I wasn’t very comfortable around most people. Why? I’d tell you I was shy, but I wouldn’t be saying very much. And it’s not like I was bullied or anything – no one picked on me or hated me in particular. I might’ve preferred being by myself, sure, but I still had a few friends – it wasn’t like I hated being around people. I think someone called me mute once. It’s been almost a year since I graduated and I’ve… moved on… since then, but I’d be lying if I said it’s all just in the past. When we graduated, that was that – some of us went to the same university, some didn’t. I ended up cutting ties with most of those who didn’t, and I still don’t find myself talking a whole lot with those who did. But, hey, at the very least I’ve come to realise how silly I used to be, trying to stay away from people like the plague – it’s all just a natural part of growing up, and only now did I get the chance to finally join the club. OreGairu understands this. All of it. Everything. You see it in the slight furrow of Hikigaya’s brow as his head rests on his palm, eyes brooding over to the noisiest parts of the classroom. You see it in the droop of his shoulders, hands finding solace where his trouser pockets were, as his bag bounces in perfect rhythm to each of his slow, dreary steps. OreGairu knows what it’s like to sit in that corner of the classroom, by yourself, never talking, with you finding your mouth a little stale when it’s time to leave because it’s been closed for so long. It’s just that OreGairu… does not think these things are silly. People are weird. We say one thing when we mean the opposite, we’re quick to find flaws but we’re not quick to trust. We’re nasty for the sake of nastiness, and we’re still all sorts of vicious to others even when we don’t know it. People are complex and hard to understand, incredibly strange and all sorts of unpredictable – no one plays by exactly the same rules, and we will never reach a perfect understanding of each other no matter how hard we try. I’m with Hikigaya on this one: why do we still keep trying to get caught up in this mess when we know it’ll just cause us all sorts of problems later? …Or that’s what I’d be saying a year ago, at least. Because to someone like Hikigaya – someone like me, in the past – we can’t explain why people find themselves inevitably drawn to each other anyway. Because to OreGairu, you don’t need to. It’s how when you strip away all of his self-defeating cynicism and hateful snark, Hikigaya is actually a pretty ordinary teenage boy, with all the same desire, jealousy, and fear as any other. We see it when he’s with Komachi: he’s not with the outside world anymore, he’s with someone he knows. He’s calm, he’s open, and she listens while he lets out all of his deepest wounds, all of his most buried secrets. It’s no surprise, of course, when they’re family – they’ve been there for each other for fifteen years, and they’ll be there for another fifteen more. Hikigaya says he lives the way he does because he has no other choice, but that’s not true – he lives the way he does because he doesn’t trust the world enough to share himself with it, to share the Hikigaya that banters so naturally and playfully with his little sister. But it’s a slow process. OreGairu only manages to give us a vague eventuality, a “one day he’ll change” kind of thing, because it takes actually spending time with your closest friends to realise how far you’ve managed to distance yourself from them in the first place. Hikigaya’s finally starting to open himself up to the world, even if just a little, and through OreGairu we see how that can have profound effects on other people. Even then, he still doesn’t get anything more from those who aren’t close to him than a “you’ve kinda changed”, with them finding him only slightly less boring to look at. Because… that’s how it is. Because it’s the small things like that that show how, someday, maybe when he’s dusting off one of his old yearbooks he found in his garage, he’ll be able to look back on this moment as just an embarrassing memory – when he could say he was more open, honest, and true to himself than ever before. My birthday’s coming up in a few weeks. I’ve never been to many parties, but maybe I’ll invite a few people to a movie or something. I know I won’t change in a week, and I certainly won’t change tomorrow, but in a year, maybe two, I might not be saying the same. OreGairu gave me a chance, and I’m not letting it go. But I can thank it later. For now, it’s time to turn OreGairu off – I have some old friends to catch up on. A sequel to any anime always presents a challenge to both the creators and viewers of the show simply because the creators have to produce something better then what it started with in order to satisfy the majority of people that wished for that second season and the viewers have to decide whether or not the sequel lives up to the expectations that they wished for (In this case 2 years ago). Let me start by saying this... Yahari Ore no Seishun Love Comedy wa Machiatteiru. Zoku is by far absolutely brilliant in what it brings to a "typical" high school anime combining elements of drama, comedy, and romance into show that screams to be watched by the masses. Story: While most high school anime focus primarily on romance, drama, or comedy, Zoku balances the 3 elements and incorporate each to make a show that isn't over saturated with love triangles or clueless airheads that can't take a hint. What is also phenomenal about the show is the realism that it portrays as we take the perspective of Hikigaya and dive into his life as a ordinary high school student who just wishes to be alone. The story focuses primarily on the troubles and tribulations of high school life whether it be helping a friend with social anxieties or assisting the student council president in daily activities. It takes these everyday problems that students have to deal with and creates these situations where Hikigaya is forced to cooperate. What grasped my attention the most is how Hikigaya deals with these situations that he is presented with and what he does to resolve these problems through is own personal beliefs and the experience he has gained by observing society and the fake attitudes that people conceal behind a mask of popularity and social status. What drives the show and makes it worthwhile is to see how Hikigaya handles these situations along with his fellow club members and the sudden shifts, turns, and drops this emotional roller coaster of a show throws at you as you try to discover the "Real Things' this show truly offer. Characters: At the time you're reading this I can safely assume that you watched the first season of the show and have a general understanding of how our 3 main characters act and behave so I can make this short and simple. Let's start with our main protagonist Hikigaya Hachiman, If you haven't seen the first season then I advise you to go to that now because Hikigaya can be described in one word and that is Pragmatic. Hikigaya always takes things at face value and honestly doesn't care about what people think. He's anti social in a way that he wishes to be alone because he knows this would not only benefit himself but the people around him. It creates this awkward tension that makes Hikigaya either loved or hated by some but personally I see Hikigaya as a character that should be respected because of how he analyzes the world around him which to some respect is cruel but 100% true. Then we have Yukino Yukinoshita, Yukino can be described as an "Ice Queen" and will literally never "let it go" if you ever cross her bad side. She's smart and beautiful in way that is both cute and deadly at the same time. She has this "Royal" essence that makes her a force to be reckoned with and her snide remarks towards those she finds inferior make Yukino a beautiful nightmare you wish you can witness. Lastly we have Yui Yuigahama who is our cheerful little ball of sunshine that brightness up everyone's day whenever they are feeling down. She is the type of girl that needs support and friends to keep her company and will do anything to keep that friendship lasting until the very end. Art/Sound: The animation of this season compared to last is a enormous improvement beyond many levels of quality. They switched to Feel Productions and I applaud the overall animation quality knowing how hard it must of been to make Hikigaya's eyes seem more dead then usual along with the cast being improved drastically in only a 2 year gap. The backdrops were stunning, The art style fit the theme well, and by far it was the best animation they could have possibly created. The opening was fantastic as I believe it was a better opening then it's predecessor and the ending was also catchy as sung by the voice actresses themselves just as last season did. The OST's of the anime were good as it fit the show nicely at just the right times and I have no complaints at all for it was simply put, better then last season. Yahari Ore no Seishun Love Comedy wa Machigatteiru. Zoku did everything it was set out to do and more. It provided a story that made me want to watch over and over and left me depressed as I waited each weak for each episode to release. It brought back that sense of nostalgia 2 years ago when I was watching the first season and it reminded me how much I love Hikigaya. If you like an anime that revolves around a school setting where the premise of the story is everyday problems that have to be solved by someone who really doesn't wish to be part of society then please watch this show. I can't recommend this show enough and you won't be disappointed. The novels are the main source material where this anime is adapted from and I wait for the day that maybe... and just maybe... a season 3 will be announced. *I'm going to be using those abbreviations A LOT! One of the the many good points of this series. My Teen Romantic Comedy SNAFU is very contrary to its name. Instead of acting as most ordinary SOL RomCom (Harem galore, Idiot Protagonist, generic females, et cetera), it acts more like a deconstruction of the genre instead. It's a story that while on paper is mundane, is told from an interesting point of view of a pessessmistic but kind loner. That is what makes the story good and better then the average RomCom. We recieve various monologue from the protagonist, Hachiman Hikigaya(8man) so while the story itself is somewhat mundane, the actions that Hachiman takes and the thoughts he thinks make the story compelling and intriguing to watch. The story continues from the first season, as Hachiman continues to solve problems that are brought to the Service Club. However unlike the first season the second is much less comedic and more heavily invested on the complex emotions of the multiple characters that the show presents. Despite being a “romance” anime, it isn’t the shows full focus. There are a lot of that, and many teasing of characters being liking each other, but it is a secondary concern below just simple friendship and character interaction. The art from this season is a large step-up from the original one. The character designs being the biggest change. At first, I actively disliked it at first, but as I continue to watched the character designs began to not only grow on me, but grew to the point where I like it more the original. Their looks now allow for more emotions and are less stiff. Studio Feels also manage to create great animation that allow you to be able to understand character thoughts just through their movements. All and all, the art and animation for the second season was fantastic, and while not as flashy or pretty as some of the action series as of late, but it is quite stunning in its own right. The opening was actually pretty average for the most part, and in to be quite honest I prefer the opening of the first one. However, the anime counters that by making the ending fantastic and much better than the one from the first season (again, in my opinion). But the background soundtrack and voice acting is where this anime truely shines. Its subtle and minimalist tracks helps build up suspense, and allow for emotions to come naturally. The music will never overtake what is happening and will never be the star of the show. But it never needed to be, it being a minimalist type soundtrack. It purpose is to enhanced the show and what is going on, it tracks help amplify suspense when need, it also builds sadness or joy when it is played. A lot of people I know and probably a large portion of music-lovers out there dislike minimalist music so this track probably isn’t something you can listen to over and over. That being said, a few out there will find this enjoyable to constantly listen to, and some of you might even find it among your favorite music tracks. Regardless, few can argue that the music got what needed to be done, and did it with flying colors. The voice acting make the already realistic characters seem more real, and makes for what they say actual conversations that could happen instead of just characters in a fictional setting, talking. Oh boy, the character is where this truely surpassed my expectations. Being a RomCom, I went into this show expecting s***. As mention above RomComs usually follow a very generic formula. One of the ingriedients would be generic as hell characters, Idiotic and nice protagonist along with girls to fit every fetish and tropes to fall in love with said protagonist. This show does almost a complete reverse, with a highly realistic(pessimisstic) and intelligent protagonist with only two fully fleshed out and developed female protagonist. Let’s talked about Hachiman(8man) first, as well as talking about how much I love it when a show implements catharticism correctly. This could range from when Hachiman puts down other people with his superior rationality, or when he solves problems by commiting social suicide only to realized later on that it was a TSPP(tempory solution permanent problem). His way of thinking and morales in life resonates with me on a personal level. Which is a large reason why Hachiman is a character that is not for everyone. If you could relate to him through life experiences or you’re able to understand and realize his viewpoints on life then he may very well be one of your favorite main character in any series, SOL RomCom or otherwise as he was for me. If you’re one of the people mention on the list of people who would hate this anime, Hachiman is probably the biggest reason why. He is negative, and cynical, which is great as now their is a main protagonist that is similar to me and millions of other people out their who aren’t optimistic as soceity tells us we should be. Now on to the female leads, which we have two of. Yukino being the first one we are introduced to, and like Hachiman, is a loner and has been bullied in her younger years. Unlike Hachiman however, she is far more successful and thus, sometimes have a superiority complex. She faces many of the same problem that faces Hachiman, but many of the times these problems require different solutions and are caused by different causes for the two characters. So it makes the two characters, while similar, also distinctively different. This causes many opportunities for the the. Final, but definitely not last of the main characters, is Yui. She is the bubbly, happy, social type. And she is absolutely and one hundred percent necessary for the show to work. She acts as a foil to the two other main characters, but in some odd way is still as completely relatable as the other two. Her interaction and chemistry with the other two is at times comedic, and at other time emotional brings along a whole entire other sets of problems. Her character brings to light an entire different view point and to put it simply, without Yui, the entire show would be completely different and more than likely, no where near as good. The most important thing about the supporting cast is each supporting member is that each one is a fully fleshed out character and anyone who is named would likely show up more then once. They are each filled with their owned personalities that are not just generic tropes, each often having problems that can watchers can relate to. Each are realistic, such as Hayama who despite at first seems like a Gary Stu, later turn out to be just as troubled and filled with problems as everyone else in the show, or Komachi who (for the first time in forever not a love interest), actually act as a simply would to the main character. Having fights with him, giving advice, understanding, apologizing for mistake, et cetera. All this combined with the emotionally broken and trouble main characters each being rejected by society in some way make this show have the most diverse set of characters and one of the most realistic and relatable group I have ever seen from not only anime, but from a story in general. Like all my other reviews, the enjoyment is not factored into the final review, so this long section is completely skippable. What else is there needed to be said, everything that praises and critics (to which there are few) have already been said in the moderately long review. So lets talk about why this anime means so much for me (which again, if it is boring then is completely skippable), and while it rank at number two in my list of favorite animes. The reason is simple, I have never in my entire life relate to an anime as much as this one, and even more than that I have never relate to a character as much as Hachiman. Like him I have tried to reach out to make friend in the past, only to be left in severe disappointment. It didn’t take long after that to just simply stop caring, and since then I have always been more pessimistic than an optimistic. And with every telling me that is an terrible way of living and that would lead to wrong to thing negative thoughts, only enhanced my pessimism, as using optimism to “help” a pessimist really doesn’t work. I could fully imagine what it would be like to be in his shoes and often could see the world through his eyes. From him getting rejected without much thought by a crush. From being despised from a trait that was gained at birth, and from spending hours simply doing nothing looking at others doing things that required more then a single person. I could also imagine myself in his shoes, when he was trying to do the right thing, but not being able find a method that would not involve hurting and most likely more then likely others. As a result even now, I only have a small group of friend and even a smaller group in which I can freely talked and express my problems. My advice for anyone who meets a Hachiman in their life and want to become friends with them would be to never talk about celebrities with them, but more importantly be patient. Just be patient and stick around and never try to “fix” them. My advice for people like me or Hachiman (which can be taken with a grain of salt) would be to stop thinking that your way of living is wrong, it just different. Don’t try to make friends for the sake of making friends, but make friends who you would help you when ask, and you would help if they ask. That got a little heavy and I also didn’t imagine it would go on a mini therapy (though I don’t think I made a great therapist) session. Well that is the reason why this show recieve a perfect ten in the enjoyment catagory, that and because even though the show isn’t gear towards everyone, I felt like one of the people that is was gear towards. From it storytelling, to its art, to it beautifully constructed minimalist soundtrack that I could listen to over and over again, and it splendid and beautifully constructed cast of main characters. Since this is skippable, let’s talk about the romance to which I can quickly sumarized up with imagery. You see there are two gigantic battleship which have said and are fighting each other. There is also a ship for a cute underclassmate, but that one is more like a wooden conoe. Anyway, I currently being told to walked the plank on both ships multiple times because of how much I like the characters. What I’m trying to say is I have literally no idea what side I am on, and would be happy and sadden by any choice the author picks for the main character. Which is kind of a lose-lose and win-win senario. Confused. So am I about how I feel. Then go watch the f***ing show. I’ll end it here, just so you can so watch it, heck, I’ll even include a link to the show on Crunchyroll. Yeah, I like it that much, and writing this review kind of made me appreciate it more. Not sure if it will have the same effect on you, but hey, there’s only one way to find out. Oregairu has really built up quite a reputation ever since it first aired didn’t it? Whilst the reaction to it was a mixed bag of “Haganai if it was actually good” and “ugh, this is pretentious garbage” back in 2013, two years of steadily increasing attention from the light novel community and such have turned it into the only post-Spice and Wolf light novel adaptation that people can say is actually good with a straight face. The fact that Studio feel was attached to the new season did make some people moo a bit, but not enough to prevent it from reaching the top 100 on MAL upon airing of the first episode. And of course, with huge popularity comes a huge and quite frankly f*cking awful fanbase that I’m going to swiftly ignore because I have it on good authority that reading their comments actually causes eye cancer and it shouldn’t really affect any personal judgments about the show anyways. As for my own personal judgment, I remember being really harsh against this show back when it first aired, but I honestly can’t remember why. In fact, I barely remember what happened in the first season beyond Hachiman joining a club with two troubled girls named Yui and Yukino who may or may not have a crush on him, and helping people out in his own cynical self-defeating way. I remember the visual design being kinda meh because Brains Base hasn’t done a good job at offering anything more than stale colors for years, but they were still a better alternative than feel’s usual output. So discovering that the animation and direction in this season actually put Sankarea’s Shaft-like surprise presentation to shame was more of a pleasant surprise than Nintendo finally releasing a new IP. Third-person shooter, you say? Wonder how long it’ll take for them to milk that into oblivion. I do remember the first season feeling like a load of build-up for a climax we never got though. Things happened, but the only real contribution to the story was some characters going through minor realizations that they had yet to use. I’m fully aware that conclusions aren’t the final judgment of quality and that buildup is important too, but you’ve got to use that buildup for something or else you’d just be like the anime version of Destiny: always on grind. So does the second season of Yahari fix that? Sure...in some alternate universe where good anime is more plentiful. The anime continues from the conclusion of the school festival arc in the first season when Hachiman is confronted about his self-defeating personality and how it can be really troublesome to people around him. But that doesn’t stop him from putting it to use in order to break up a confession surrounding one of his male companions and a girl he likes, which causes a rift to form between him and his fellow club members, who agree with him about as much as I agree with anybody who continues to deny the existence of global warming (how blind can you be to not notice our abnormal weather, you idiots?). This rift starts to grow wider when some girls from his middle school life, including one that he confessed to, show up around the same time a student council election occurs and the club is asked to help one of the students bail from it by nominating themselves. From there, Hachiman is put through the ringer regarding his own personal demons and if he can’t get past them, he’ll lose the few people in his life who actually do care for him. A good drama in theory, but the show enters Spice and Wolf territory in that it has a weak base conflict and it doesn’t even really follow up on its potential. Imagine if you were watching a drama and the base conflict for much of the story was about some dude refusing to admit that he hated bananas. You may be thinking “wait, that sounds f*cking stupid”, and that’s what I said with the majority of the season minus the f-word. It was impossible for me to hold student council elections on the same level as the highschool version of Jesus’s sacrifice because A) it didn’t work when Degrassi* did it B) you can still hang out with each other and stuff if the club doesn’t exist anymore. There isn’t any sacrificing schoolwork and your future for the club with no guarantee that you’ll succeed. It’s just really personal conflicts that aren’t given enough grounding to make any sense, and it dragged out far longer than it should have. I wouldn’t call the conflicts as bad as Spice and Wolf’s because there’s more to Oregairu that makes it one of the better LN adaptations than furthering relationships - or as much you can nail relationships in regards to LN-like characters. Unlike Lawrence, and Holo to a lesser extent, these characters have some ghosts in their life and the relationships are a means to exploring them, even if it still doesn’t do as much with them as it should have. One way to fix that would have been to reveal what Yukino’s problems actually are. Yeah, we know she’s bad at socializing, not helped by an annoying older sister who acts like a cocktease boyfriend stealer from a crappy doujin or an even crappier gross-out comedy, but the show is as fast to reveal useful information as video game companies are to release actual reasons to get hyped for their products. The name is there and it looks nice, but how about some actual gameplay, huh? So there were multiple times when the show just kind of lost me, mired in the very idea of its self-loathing that it forgets to really develop it beyond its base premise and goes into Catching Fire-levels of “holding out but have faith in us” right down to having a very similar style of ending. And it annoyed me here just as much as it annoyed me in that movie, because it looked like it was finally going to get interesting regarding the relationships and inner-problems that the characters have been going through in its last two episodes. The characters make up and come to realizations about their current situation, but the future is still vague and you need to take more than the small steps you just went through in order to achieve real personal growth. But nope, the show ends at what seemed like the middle of a story that has had too much devoted to its buildup and we’re not going to be getting another season anytime soon given how many of the light novels there are at the time this review goes out. It frustrates me to no end to see what anime could have been, only to come off as unfinished. Maybe you could say that the realization that the characters love their life and their friends and are even capable of romance is enough for you, but that feels kinda weak to me. There are plenty of shows on the Disney Channel that say the same thing, and being better executed isn’t enough to really make Oregairu any different from them. Sure I wouldn’t have been comfortable with sitting through love triangle drama, especially if it involves a man named Armani, but sometimes you’ve just got to rip off that bandage rather than peel it slowly and prolong the pain by 10x the amount it would have taken otherwise. *I never actually watched Degrassi so I don’t know if it overdramatized student council stuff, but it wouldn’t surprise me either way given how much else it overdramatizes. Why are high school people having mid life crises?